CD22, a member of the immunoglobulin superfamily, is a B-cell transmembrane glycoprotein that acts as an accessory-signaling component of the B-cell antigen receptor (BCR). Recent evidence indicating the role of CD22 as a negative regulator of BCR signal transduction prompted us to test the possibility that genetic variations of human CD22 may be associated with autoimmune diseases. 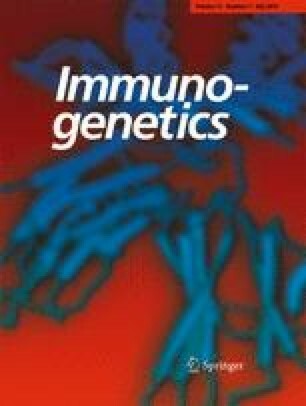 In this study, variation screening of the entire CD22 coding region was performed, and possible association with rheumatic diseases was tested, using the genomic DNA from 207 healthy Japanese individuals, 68 patients with systemic lupus erythematosus (SLE), and 119 patients with rheumatoid arthritis (RA). Through the variation screening, seven non-synonymous and four synonymous substitutions were identified. In addition, single base substitutions were found in two introns flanking exon-intron junctions. Among these variations, Q152E substitution within the second extracellular domain was observed with a marginally higher frequency in the patients with SLE (3/68, 4.4%) than that in healthy individuals (1/207, 0.5%) (P=0.048. SLE vs healthy individuals), although this difference was no longer significant after correction for the number of comparisons (Pc=0.62). No significant association was observed between any of the variations and RA. These findings indicate that a number of genetic variants are present in CD22, and suggest that CD22 could be considered a candidate for the susceptibility genes to autoimmune diseases.